Ever wish you were a little kid again? Last week, Tigger didn’t feel very good (diarrhea throughout the day and keeping us all up at night) and developed a cute after-nap habit to replace her usual one, which is standing up and walking over to her stuffed animals to play the moment she awakens. For three days while was sick though, she woke, called for me, pointed to her shelf of stuffed animals, and requested, “ng” (it means “want”). I handed her a stuffed animal. She played with it for a few seconds, pointed back at the shelf, and another “ng”. 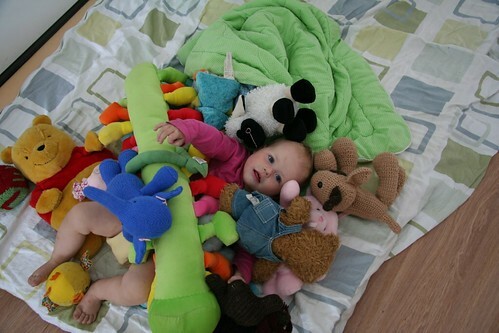 Then repeated until she had all the stuffed animals. I thought it was so funny I had Baba take a picture the second day she did it (above). I even had a few meditations on the way she depended completely on me to provide for her that which she wanted, which helped me notice in my reading in John the next day that Jesus fed the five thousand “as much as they wanted” (not just “needed”; from chapter 6). I often wish I were — or at least acted more like — a little kid again. With a child’s trust, problem solutions, and complete dependence on Mama and Baba to make everything better. And to bury all yucky feelings in a pile of soft cuddly animal friends!